A PROJECT at Frome Medical Practice has been hailed in the national press as a blueprint for helping the NHS crisis, after figures revealed that it has reduced the number of emergency hospital admissions in the area. 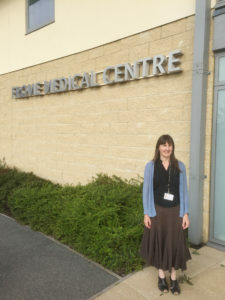 The Compassionate Frome project, launched by Dr Helen Kingston at Frome Medical Practice, with the help of Health Connections Mendip and Frome Town Council, has identified that helping patients who are lonely and isolated connect with support in the community, has a positive impact on their health. Whilst emergency hospital admissions across Somerset have risen in the last three years, the Compassionate Frome project has helped to reduce emergency admissions in Frome by 30 per cent. This is the first intervention that has successfully reduced emergency admissions to hospital across a population, and could offer the possibility of averting the current crisis in the NHS of increased admissions to hospital and rising NHS costs. Emergency admissions account for nearly 20 per cent of the £110billion healthcare budget. The results of the trial were published informally last week in the magazine Resurgence & Ecologist, with The Guardian calling the news “one of the most dramatic medical breakthroughs of recent decades” if the results are upheld after a review by a medical journal and peers. The aim is to break a familiar cycle of illness reducing people’s ability to socialise, which leads in turn to isolation and loneliness, which then exacerbates illness. Speaking to Frome Times, Dr Kingston said, “I am proud of what we have achieved. Frome is a special place with a great community spirit. We are very lucky to have a council of independents and the opportunity to showcase this project on a national level. “The aim of this project was to improve patient care and coordinate what is best for the patient.The prime driver has been to support the patient to manage their own health. “Patient-centred care also helps staff to feel like they are making a difference, which is important in these hard-pressed times. Describing how the project works, Dr Kingston and Dr Julian Abel, the lead author of report said, “Social connectedness has a bigger impact on health than giving up smoking, reducing excessive drinking, reducing obesity and any other preventative interventions. “Until now, it has not been known how to use this in routine clinical practice. Through paying attention to people’s community networks, the medical practice and Health Connections Mendip, the community development service, reconnect people to both their own supportive network and the extensive community activity that already exists. “Compassionate communities does not take the place of social care. Rather, it has three components. “1. Through making the most of the supportive networks of family, friends and neighbours, people build care and connectedness, love and laughter, sharing companionship and values. Some of this is task-related to caring and some is increasing a sense of belonging in communities. “2. Building networks of support for the routine matters of life, shopping, cooking, cleaning, looking after the garden and pets, providing lifts. “3. Linking to community activity, such as choir, walking groups, men’s sheds, talking cafes and other interest groups where people can make friendships and share life’s events. My name is Dr Chris Steed. I represent the Totton community project approach to tackling isolation. We are using arts and music in a strengths-based way. Social prescribing is central. Who can I talk to please about this to find out more? Is the project being evaluated?